In this article you will find the results of my work on photo-sensitized gelatin without dichromate. 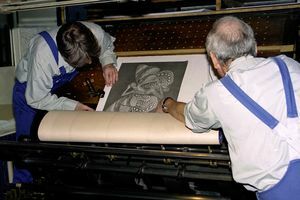 Few publications have been made in this area to substitue dichromate toxic to prepare a printing plate for collotype. Is it possible to use a low toxic reactive or not toxic? This question is interesting because of the dangers posed by dichromates. To obtain a sensitization of the gelatin equivalent to the one that we obtain with the dichromate, the quantity of DAS must be appreciably equals. Contrary to what is announced for the photo carbon where only 1/3 of the equivalent weight dichromate seems sufficient, the amount is slightly higher for correctly to tan correctly the gelatin of the collotype matrix. In case of insufficiency of DAS, there will be an complete formation of the image, but the inking will be made with difficulty. The diazidostilbene is very photosensitive, including white light. The operations are thus made in adiactinic light. The UV sunstroke must be more intense. 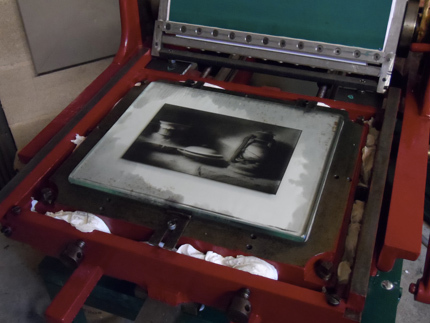 For my part, to obtain a sunstroke identical to that obtained with the dichromate, I eliminated one of the two sheets of copy which I insert between the negative and the window of the insoleuse. I kept identical UV durations of sunstroke. 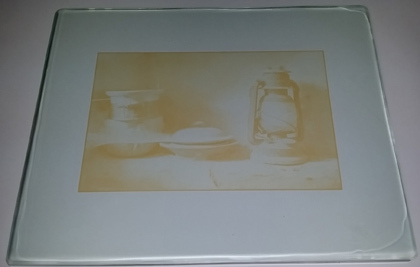 After the UV sunstroke, the image is clearly visible on the plate, but of an orangy color, while with the dichromate it is rather brown. After the UV sunstroke, the plate must be revealed in an oxidizing bath. Contrary to what is made with the dichromated gelatin, it cannot be directly plunged into the water to soak because in this case there would be no formation of the image. For my part, while others users of DAS use a solution of potassium permanganate, I use an aqueous solution of hydrogen peroxide which is also effective and not toxic. 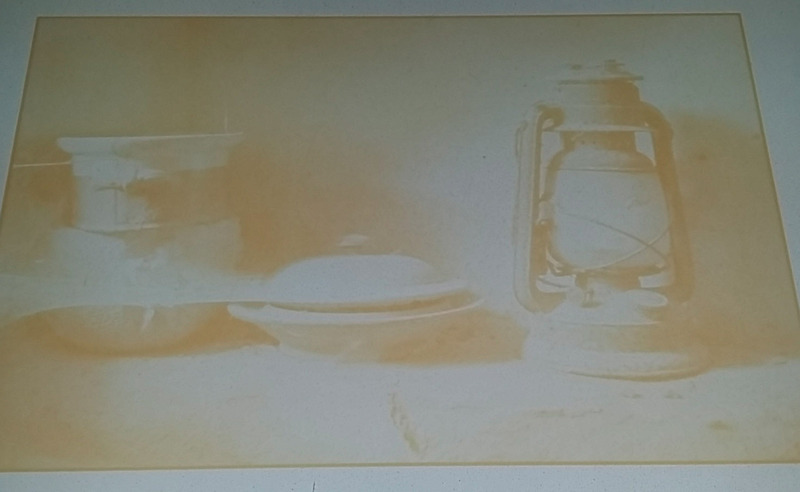 Collotype plate sensitized with diazidostilbene and inked. This first developing bath is followed by a bath of pure water then by the third bath of water to which we add some sulphite of sodium and the meta-bisulfite of sodium during a few minutes. In the outcome, any track of DAS in the parts not tanned is removed. Only the image stay with an orange color, but it is without incidence for the continuation of the operations. The plate is then put rinsing in the cold water during approximately one hour. There is no draining as for the dichromate. It is a time-saving. 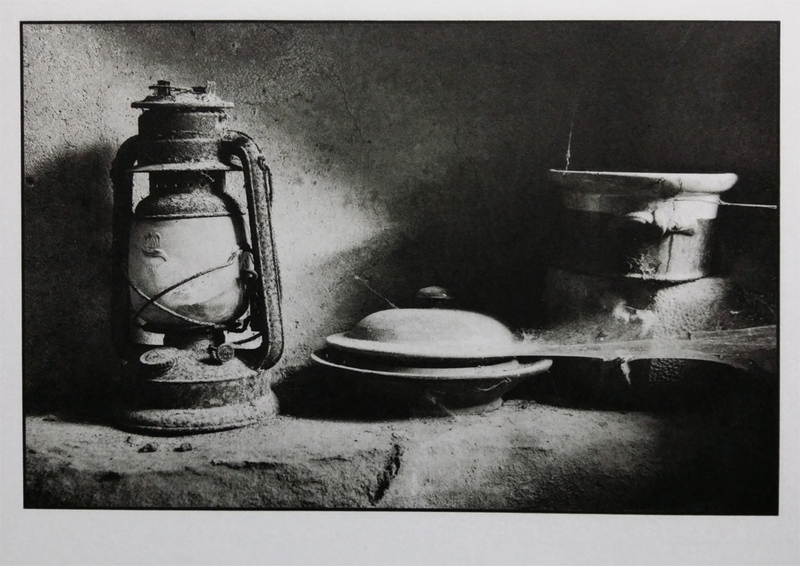 Conclusions : The diazidostilbene is a photo-sensitizing which works well for the collotype. There is no visible difference on the result obtained in the point of view of the grey scale. The work in adiactinic light represents a surmountable difficulty. The operations of development come to be added while they do not exist with the dichromate, but the total duration of preparation of plates is shortened because the duration of draining in the pure water after the bath of sulphites can be reduced at the 1 hour. Note to carbon photo : There are no difficulties with the use of diazidostilbene. The only obligation is the work in adiactinic light up to the sulphite’s bath . The slightly orangy color of the image (shown in non-pigmented gelatin) may possibly influence clear pigments. So the diazidostilbene is one photo-sensitizing not toxic which can be use without particular difficulties for the photo carbon. (1) DAS is an aromatic azido Compound which can be used to sensitize gelatin and other colloids for various Photographic printing processes; processes which have historically called for ammonium or potassium dichromate. Unlike the dichromates, DAS is non-toxic, non-carcinogenic, has no dark-reaction, plus the materials made with it can be stored for long periods of time in a sensitized state.